On Bengals.com, Cincinnati Bengals wide receivers coach James Urban said that wide receiver Josh Malone has “showed us what we thought he was” and has “a bright future.” The Bengals drafted Malone in the fourth round this year. 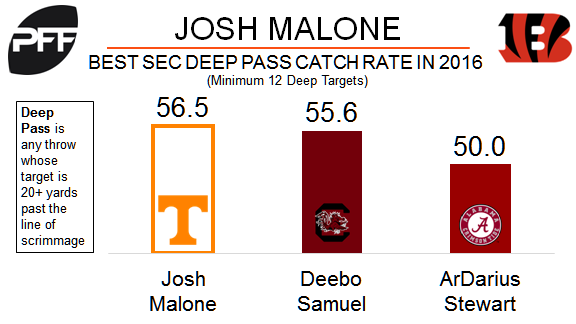 Malone was PFF’s 20th ranked wide receiver in this year’s draft class out of Tennessee. His 77.5 overall PFF grade in 2016 was 58th out of 511 qualifying wide receivers. Malone was an effective deep threat last season, catching 13-of-23 deep targets (20 or more yards downfield) for 509 yards and 10 touchdowns. His 56.5 percent catch rate on deep passes was best in the SEC (minimum 12 deep targets) and ninth in the nation.